What URL do I use for the Power BI App? When using the Power BI App for Windows, in order to get to your reports, you have to start with a URL to pull the reports (Workbooks) from. This is done by going to the browser area, and then you can enter the URL after swiping up from the bottom or right clicking in the app. If you are in the Power BI Sites, and grab the URL for that, this actually will not get you what you want. This is not the URL you are looking for (waiving Jedi hands). When trying to use this with the App, you will encounter the following. Server ErrorWe couldn’t retrieve data from the server. Please try again later. There are a few ways to get the URL that will work with the app. 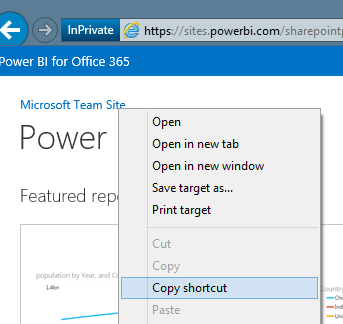 The first is to copy the shortcut for the “Microsoft Team Site”"
This will give you the URL for your tenant. The other way is to copy the shortcut when you are actually on the main SharePoint site. The URL should have SharePoint.com within it. After that, you may be prompted for credentials if you haven’t been there before. Then you will see the folder structure and files for your site.